Dr. Ben-Jei Tsuang, a professor at the Department of Environmental Engineering in National Chun Hsing Universi ty  [zh],  is the latest victim of a defamation lawsuit brought on by a big corporation, the Formosa Plastic Group . Increasingly, big corporations in Taiwan are using defamation lawsuits to silence activists and scholars. In fact, many legal experts suggest that the current criminal defamation law is in violation  [zh] of international covenants. In response, two affiliates of FPG, Formosa Chemicals & Fiber Corporation and Mailiao Power Corporation, filed criminal charges at the Taipei District Prosecutor's office in early April, 2012, seeking NT$40 million (about USD1.33 million) in damages for defamation  [zh, pdf]. Dr. Tsuang explains the environmental impact of the petrochemical industry at an anti-Kuokuang petrochemical project protest. Photo by Gea-choas, used with permission. 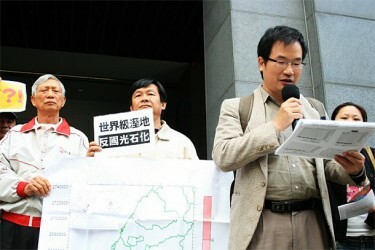 Dr. Tsuang's findings are critical for several civil groups who have been advocating to stop the Kuokuang petrochemical project . In fact, these groups already won the battle, as later FPG failed to persuade any local government in Taiwan to approve their petrochemical project and decided that the project be moved out of Taiwan and relocated to Malaysia  in May 2012. With this in mind, Shih-Wei Lu, a lawyer who is assisting Dr. Tusang's defense team pointed out  [zh] that the lawsuit is a ‘strategic lawsuit against public participation ‘, in other words it is intended to censor, intimidate, and silence critics by burdening them with the cost of a legal defense until they abandon their criticism or opposition. We, a coalition of civil groups, would like to thank these researchers, including Dr. Ben-Jei Tsuang. With their diverse expertise, their researches have revealed how FPG’s Six Naphtha Cracking plant has polluted the environment and affected citizens’ health. The polluter should prove their innocence by providing data to the public. 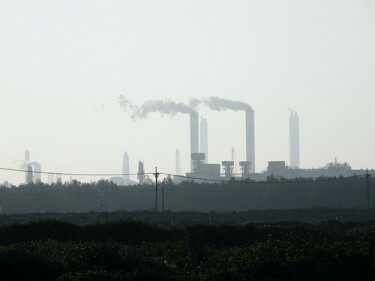 FPG’s Six Naphtha Cracking plant should give the public information of its pollutants emitted into the environment…If FPG cannot provide the evidence that “the air is clean and the scenery is beautiful” around the plants as depicted by its founder Yung-Ching Wang , FPG should drop this lawsuit. Ignoring our suggestions will worsen your corporate image and the society's impression and evaluation of your company. FPG's Six Naphtha Plant is considered a serious pollution source. Photo by Changhua Coast Conservation Action. Used with Permission. FPG can ask other researchers to conduct another research and challenge the existing findings. They can turn it into an academic debate…Nevertheless, FPG prefers lawsuits and a large amount of pecuniary compensation instead of research…This FPG lawsuit shows us that our courage to confront a boorish, low-quality corporation is worth 40 million NT dollars. Even though the Taipei District Prosecutor's Office pointed out that academic freedom is protected by Taiwan's constitution and decided  to drop the charge in June 6, 2012, FPG applied to the High Court for an appeal. Our teacher is very serious about his research. He works very hard and independently to monitor the quality of Taiwan's environment. We feel that it is totally unjust for him to be prosecuted by FPG without any good reason. Our department needs responsible professors like him and our society needs fearless leaders like him. Students from the Department of Environmental Engineering in National Chun Hsing University will stand by Dr. Ben-Jei Tsuang's side and (work towards) consolidating public support.